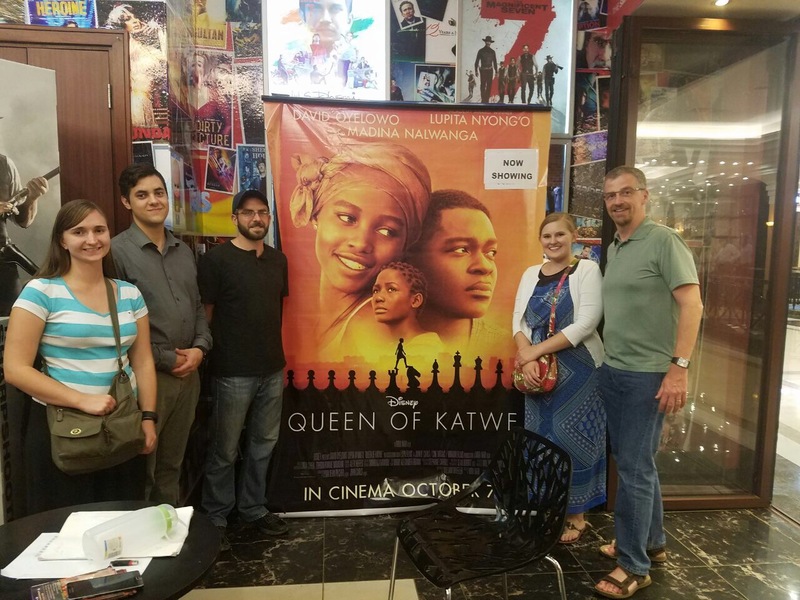 They replied that the movie that they wanted to see, “Queen of Katwe,” was a true story about a Ugandan girl and that it was filmed right here in Kampala with local actors. “Wouldn’t it be a neat experience,” they said, “to see her story here in Uganda?” Interesting, yes, but they were met with much opposition before they convinced me to go to see the film with them. As I mentioned, “Queen of Katwe” is a book and movie based on the true story of Phiona Mutesi, a Ugandan girl from Katwe, a slum in the city of Kampala, Uganda. The story shows how Phiona managed to escape poverty and to make a better life for herself and for her family by learning how to play chess and becoming a champion. I must admit that the movie was quite good, and it was pretty cool to be able to see it in the city in which it was filmed. Having been in Uganda for nearly four weeks and Kampala for three of those, it was really neat to actually be able to recognize different places in the film. Having been immersed in the culture, we were also able to appreciate many (but not all) of the social behaviors, cultural norms, words, jokes, etc. in the movie that most people outside Uganda probably will not understand or even notice. In addition to sharing Phiona’s inspiring story, the movie also gives a surprisingly accurate portrayal of Ugandan culture and what we have been experiencing here on this rotation. As an example, in one chilling scene, Phiona’s brother was hit by a boda boda and required surgery. The doctor explained that the hospital did not have any pain medication because they ran out, and that they would not have any more until the following day, so the child had to get the operation without any painkillers. The movie also shows the extreme poverty that many people face here. Phiona’s family had trouble paying the rent, which was 10,000 shillings (about $3.00). Consider that we paid 15,000 shillings each just for admission to see the movie. Consider that we have been spending much more than that on our meals every day, and that is more than what they could afford for rent for the entire month. It really makes one think and be appreciative of what one has. I would recommend that anyone who would like a glimpse of Uganda see this film. I definitely will be buying it to watch with my family when I get home. This entry was posted in Diseases/Health and tagged APPE, Binghamton University, binghamton university school of pharmacy and pharmaceutical sciences, Global Health, Global Pharmacy, Global Pharmacy Education, Kampala, Makerere University Department of Pharmacy, Mulago National Referral Hospital, pharmaceutical care, Pharmacy Students, Public Health, Uganda, Ugandan Pharmacists, Ugandan Pharmacy Students, Wilkes University, Wilkes University School of Pharmacy. Bookmark the permalink. Jenie told we should see it and u reaffirmed that, thanks Nick!